The greatest heroes in comics, together as one unbeatable team! The Avengers "go large," expanding their roster and sphere of influence to a global and even interplanetary level. Who will respond to Captain America's call? The Avengers' first missions take them to Mars, and then far across the galaxy as Captain Universe races to decipher the secret origin of the universe itself! Then, the Avengers must deal with the White Event as strangely familiar new heroes are born! Jonathan Hickman is an American comic book writer and artist. He is known for the creating the Image Comics series The Nightly News, The Manhattan Projects and East of West, as well as working on Marvel Comics' Fantastic Four, FF and S.H.I.E.L.D titles. 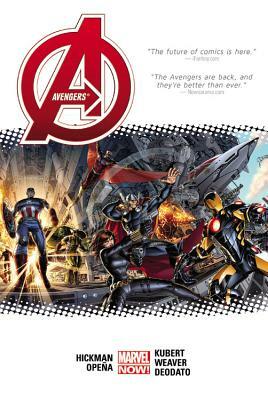 In 2012, Hickman ended his run on the Fantastic Four titles to write Avengers and New Avengers, as part the "Marvel NOW!" relaunch. In 2013, Hickman wrote a six-part miniseries, Infinity, plus Avengers tie-ins for Marvel Comics.